One page five-line holograph note, signed ‘Np’. Double matted, glazed, natural wood frame. 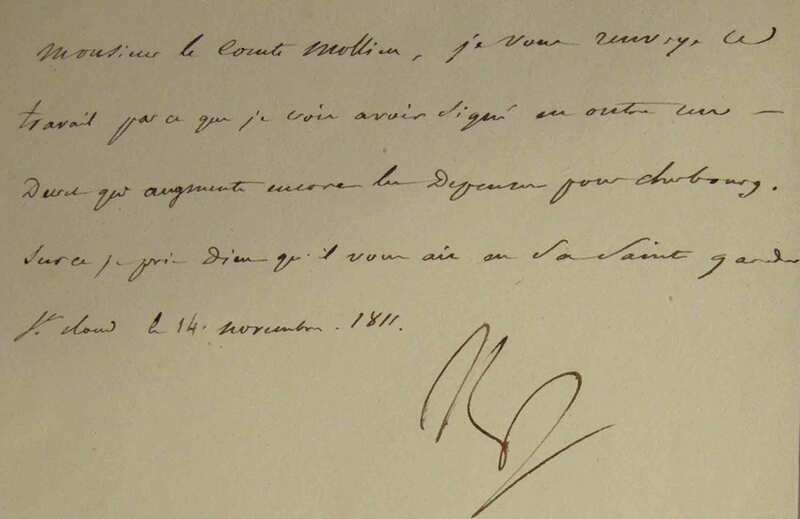 Written in French in iron gall ink to Le Comte Mollien, Minister of the Treasury regarding the defences of Cherbourg, which Napoleon and Marie-Louise (including Duroc) had visited for six days in May 1811 to inspect the ongoing work on the coastal defences. It is signed with Napoleon's customary initials (in the quick flourish he used to those of his intimate circle). In good condition and handsomely presented with an inserted oval 1/4 length reproduction portrait of the Emperor taken from a full-length portrait and reversed. Napoleon Bonaparte Born 15 August 1769 – 5 May 1821) was a military and political leader during the latter stages of the French Revolution. 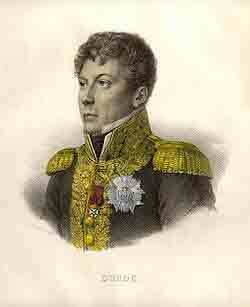 As Napoleon I, he was Emperor of the French from 1804 to 1815. 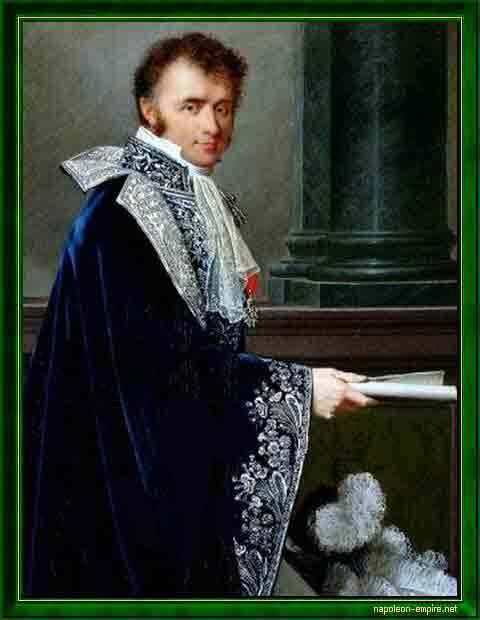 His legal reform, the Napoleonic Code, has been a major influence on many civil law jurisdictions worldwide, but he is best remembered for the wars he led against a series of coalitions, the so-called Napoleonic Wars, during which he established hegemony over much of Europe and sought to spread revolutionary ideals. Nicolas-François Mollien Born on February 28th, 1758 in Rouen, Normandy, France. - April 20th, 1850 in Paris. Minister of the Treasury from 1806 to 1814. French financier. The son of a merchant, he showed ability, and entered the ministry of finance were he became a senior figure. In 1808 Mollien was created a count. He soon came to see the impossibility of the measures termed collectively the ‘Continental System’ but his warnings on that subject were of no avail. 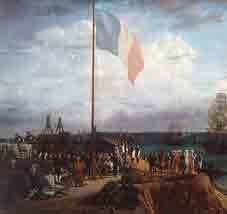 The result was the blockade of the French ports, and ultimately the peninsula war. After the first abdication of the emperor (April 11, 1814), Mollien retired into private life, but took up his ministerial duties at the appeal of Napoleon during ‘The Hundred days’. He semi-retired following Napoleon's defeat and he was the penultimate surviving minister of Napoleon Bonaparte's cabinet. General Géraud Christophe Michel Duroc, 1st Duc de Frioul. 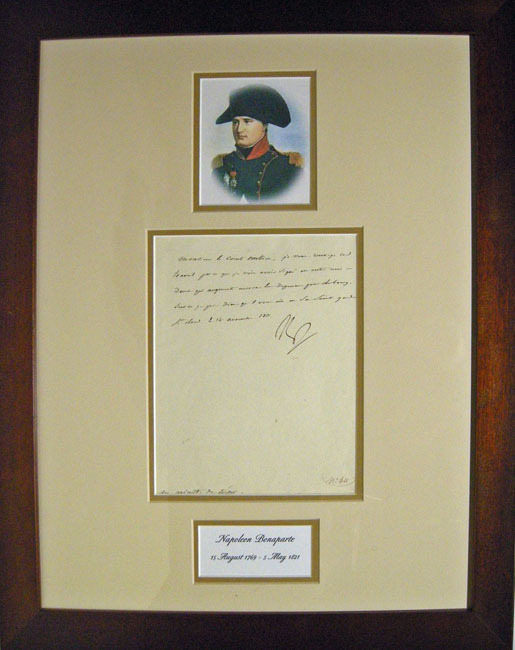 Born October 25, 1772 – May 23, 1813 was Napoleon's trusted Aide-de-camp and diplomat. He was placed in charge of his personal security as Grand Maréchal du Palais (Grand Marshal of the Palace). He had a distinguished military career, until succumbing to wounds received at the Battle of Bautzen. The name of Duroc is honoured, amongst other places, in the Paris Metro station of that name.